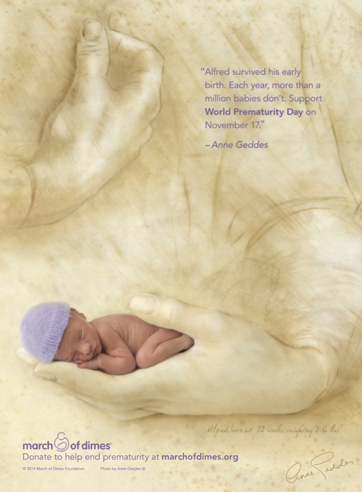 November is Prematurity Awareness Month and November 17th was World Prematurity Awareness Day. This month's Brilliant Activities for BirthEducators post is about preventing prematurity, the events of late pregnancy and the importance of waiting for labor to begin on its own. As they do every year, the March of Dimes leads the way in recognizing the importance of preventing premature births. They have provided information and resources to bring this important problem to light. The number one cause of death of young children worldwide is complications from being born too early, with estimates of 1.1 million deaths directly linked to being born too early. In the United States, one in ten babies are born premature. If you live in the USA, you can check out how your state has performed on the prematurity report card. On the international level, you can find out how your country ranks here. In the US, we also know that premature births and low birth weight babies are more likely to occur in families of color. I cover premature birth in my childbirth classes in many ways, including recognizing the signs of premature labor, and facilitating a discussion around the Lamaze Healthy Birth Practice 'Let Labor Begin On Its Own' as induction before a baby is ready and has started labor can unintentionally result in a premature birth if the gestational age is estimated incorrectly or even if the baby was not ready and needed some more time in utero. Not every baby is ready to be born at the same time. My favorite activity to do in class on this topic leaves families really understanding the benefits of letting baby start labor when they are ready (in the absence of medical complications). In small groups - the families prepare and present a short skit on the events of late pregnancy. I cover this information on week two of a seven week series, at the beginning of class. The families are just beginning to gel and we have done quite a bit of interactive learning the week before, on class one, but this is definitely a leap of faith on their part to be doing such a 'daring' activity at the start of the second class. They have only been with me and their classmates for one 2.5 hour session. I am asking a lot of them, but they always rise to the challenge. 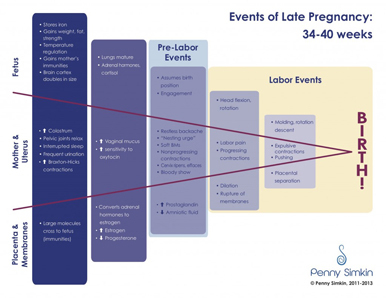 I hand out Penny Simkin's 'Events of Late Pregnancy' information sheet that is available for purchase as a tear pad from PennySimkin.com. I discuss how both pregnant person and baby are getting ready for birth in the last weeks of a pregnancy. Many different processes are happening and systems are moving forward to have everything culminate and coordinate in the labor and birth. Each and every process is critical to a healthy baby and a body that is ready for labor. I divide the class into four groups and assign each group to be either a Pregnant Person, Uterus, Fetus, or the Placenta/Membranes. I ask them to collaborate together and prepare a skit, activity, active presentation, interpretive dance, charade etc., that shares information on the changes their assigned role undergoes during the last weeks of pregnancy and through labor. I give them around five minutes to prepare and offer to provide any props that they might need from my teaching supplies. They gather their groups, take their tear sheet and head to four corners of the classroom to get to work. After the small group work is completed, we gather back as a class and get ready for the 'show.' In turn, each group (and their chosen props) heads to the front of the room to do their presentation. Everyone follows along with their info sheet. The results are outstanding and usually quite comically. Some of the most memorable presentations have included a newscaster holding a microphone and interviewing the fetus at different gestational ages. Other groups have created a giant pelvis with their bodies and had a 'baby' assume the birth position and move through. I recall a group ripped up red paper into confetti, and released it from up high to represent bloody show. Just this week, one group did a hip hop dance and chanted along with the different events. 'Antibodies' have leapt through 'placentas,' and fake breasts have leaked colostrum. Giant uteri have contracted and pushed babies out. One week, uncoordinated contractions representing Braxton-Hicks contractions 'squeezed' out of sync and then got 'organized' and worked in unison to represent labor contractions getting longer, stronger and closer together, flexing and squeezing like a well fabricated machine. I am continually amazed at the creativity and ingenuity of the results. Everyone laughs and best of all, the events are memorable and easy to recall. After each group has a chance to present their section, we debrief and discuss any questions. We bring things full circle by talking about what the impact might be for a premature birth or a birth that occurs before the baby or parent's body is ready. Everyone is clear that the process of birth and the transition that baby needs to make works best when baby chooses their birth day. We admire everyone's creativity and laugh about the mad skills that the class has! As the series continues, I can refer back to these skits and remind them of the important steps as they come up again in class. I am amazed that they have great recall of the progression. After we have finished, the feedback I receive on this activity is great! Despite their initial hesitancy to get so far out of their comfort zone, families really remember the events, recognize how important the changes are that occur in the pregnant parent, the uterus, the baby and the placenta and membranes. They can clearly articulate why it is important to reduce the chance of a premature baby and wait for labor to start on its own. The unique presentations really make things memorable and the families report back to me weeks later, or even at the class reunion after birth, how they often thought of this activity and it helped them to have patience to wait for baby to come. They knew good (and important) things were happening in the last few weeks that would make for a healthy birth and baby. How do you teach about preventing premature birth and the importance of waiting until baby starts labor? What interactive teaching ideas do you use? 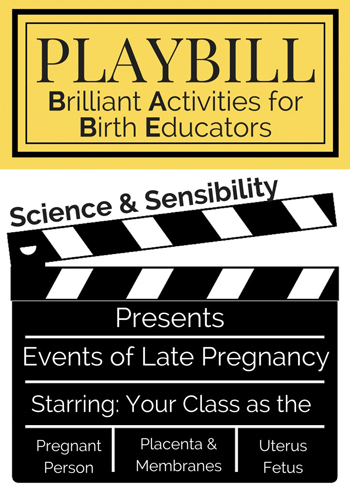 Do you think that you might try something like this in your childbirth classes? How might you modify it. Share your thoughts in the comments below. I would love to hear from you.